Major General Paul William Scheidecker commanded the Air Force Accounting and Finance Center. His intense attention was directed toward progressive financial management to meet Air Force needs in the aerospace age. The center is responsible for technical supervision of the Air Force Accounting and Finance network - 544 accounting and disbursing stations located in 73 countries. Its primary goal is to furnish Headquarters U.S. Air Force and some 14 other governmental agencies with valid, timely and easy-to-understand data on Air Force dollar obligations and expenditures. The center keeps dollar tabs on all Air Force assets; keeps appropriation accounts, expenditure accounts; examines Air Force financial vouchers and military pay records and initiates required corrective action. Each month the center issues well over 700,000 checks totaling more than $1 billion annually. Allotment checks go to families, banks, credit unions and insurance companies after deductions from the pay of officers and airmen. About $250 million yearly is paid to the Internal Revenue Service representing income tax and Social Security withheld from the pay of all Air Force service personnel. Command direction under General Scheidecker has two basic principles - that of team captaincy for assigned responsibility; and an organizational doctrine that delegates authority in fact for decisions at the lowest level possible based on sound information for good decisions. 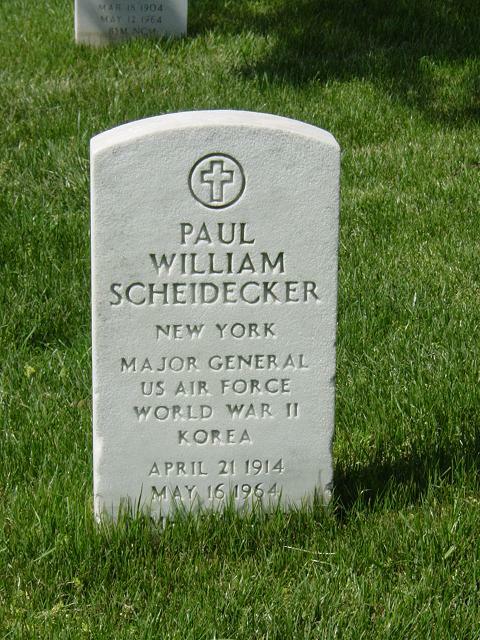 Paul William Scheidecker was born in New York, New York, in 1914. He graduated from the U.S. Military Academy, West Point, N.Y., in June 1937 and was appointed a second lieutenant of Cavalry in the Regular Army of the United States. Second Lieutenant Scheidecker was assigned to the Twelfth Cavalry Regiment, Fort Ringgold, Texas, until December 1939. At that time, he was detailed into the Army Ordnance Department, serving as an aviation ordnance student officer at the Ordnance School, Aberdeen Proving Ground, Maryland, from January through March 1940 and at General Headquarters Air Forces, Langley Field, Virginia, from April through June 1940. In August 1940, Lieutenant Scheidecker assumed command of the 346th Ordnance Company (Aviation) at Lowry Field, Colo. When the unit had been trained for overseas movement, Lieutenant Scheidecker led it to Alaska. In 1942, Major Scheidecker was appointed staff ordnance officer, Headquarters Eleventh Air Force, Elmendorf Field, Anchorage, Alaska. He served in that capacity until October 1942 when he became staff ordnance officer for the XI Air Force Service Command, Elmendorf Field, Anchorage, Alaska. Lieutenant Colonel Scheidecker returned to the United States in June 1943 and was assigned to Headquarters Spokane Air Service Command, Spokane, Washington, as staff ordnance officer. While at Headquarters Spokane Air Service Command, he also served as chief, Supply Division, and as deputy commander of the Spokane Air Service Command. Colonel Scheidecker went overseas again in September 1944, being assigned jointly as staff ordnance officer for both Headquarters Army Air Forces, India-Burma Theater, and for Headquarters China-Burma-India Air Service Command, in Calcutta, India. In July 1945, he moved to Headquarters Army Air Forces, China Theater, Chungking, China, where he served as staff ordnance officer. In September 1945, he returned to the United States; was a student officer in the First Command Class, Fort Leavenworth, Kansas, from October through February 1946. After graduation, he served at Watertown Arsenal, Watertown, Mass., as chief of the Service Department until January 1947. Colonel Scheidecker was next assigned as a student at the Harvard Graduate School of Business Administration, Boston, Mass., receiving his master's degree in business administration in June 1948. In February 1948, while a student, he was transferred to the Department of the Air Force. His next assignment was to Headquarters Air Materiel Command where, in July 1948, he became chief, Analysis and Fiscal Office, Engineering Division. When the Wright Air Development Center was activated in April 1951, Colonel Scheidecker became its first comptroller. He served in that capacity until June 1952 when he was assigned as a student officer, Air War College, Maxwell Air Force Base, Alabama. returned to the United States. Brigadier General Scheidecker's next assignment was to Ent Air Force Base, Colorado Springs, Colorado, where he became deputy chief of staff, comptroller of the Air Defense Command in August 1956. He assumed command of the Air Force Accounting and Finance Center July 7, 1960, his present assignment. General Scheidecker was buried with full military honors in Section 34 of Arlington National Cemetery.